Momeni’s fellow students at California Sate University, Northridge celebrated the release of Esha Momeni today and posted celebratory announcements on blogs and social utility tools that have kept her supporters informed. Unfortunately, in the wake of the excitement, word was just received that she was released on bail but will remain in Iran to face her charges. She is scheduled to appear in court tomorrow. Esha Momeni, 28, a dual U.S. and Iranian citizen who was visiting Iran to research a master’s thesis, may not leave the country and must still stand before a political tribunal to face charges of “acting against national security” and “propagating against the system,” said Reza Momeni, her father. Both are serious charges that can carry lengthy prison sentences. In a brief telephone interview, Momeni said his daughter had lost about 15 pounds but otherwise appeared to be in good health. He said he had to put up the deed to his family’s Tehran apartment as collateral to win his Los Angeles-born daughter’s release. Before her arrest, Momeni, a Cal State Northridge student, followed a path that differed from much of the rest of Southern California’s Iranian diaspora. While many Iranians fled their country to the United States after the 1979 Islamic Revolution, her family moved back to Iran from the U.S. in the early 1980s. Reza Momeni, a U.S. citizen and father of five, was studying in Southern California at the time of the revolution. When war broke out between Iran and Iraq in 1980, he moved his family back home. He helped rebuild damaged sites, working in conflict-ravaged areas around cities such as Bandar Abbas and Bushehr. Esha Momeni showed an early passion for the arts, learning to play the tar, a traditional string instrument, and delving into poetry and literature. She graduated from a Tehran college with a degree in graphics and in 2003 married a man her father described as a “male chauvinist” with emotional problems. The bitter breakup drove her from arts to activism, specifically women’s rights issues. She began participating in the One Million Signatures Campaign for Equality, a group that connects activists in Iran with diaspora communities in the West. Activist organizations, many of which advocate peaceful political and social change, greatly irk authorities in the Islamic Republic. Iran accuses them of being fronts for Western powers seeking to topple the government using the “velvet revolution” tactics that contributed to the downfall of former Soviet states. A report issued this month by a United Nations human rights watchdog raised concerns about “an increasing crackdown in the past year on the women’s rights movement” in Iran. “Women’s rights activism is sometimes presented by the Iranian government as being connected to external security threats to the country,” the report says. On October 24, I posted information on the arrest of Esha Momeni, a graduate student at California State University, Northridge. 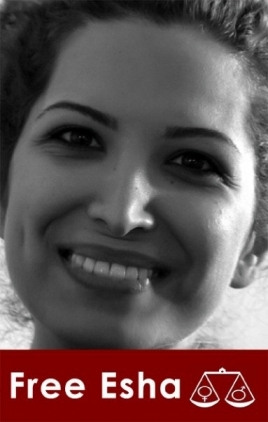 Momeni was arrested in Iran while conducting graduate research for her advanced degree in Communication Studies. In an effort to raise awareness on Momeni’s current situation and as part of the collaborative effort to bring her home, a candlelight vigil will be held in her honor. For further information, visit: the official myspace page maintained by her fellow graduate students, the Esha Momeni blog , facebook page, or the latest news report from Reuters. One of our grad students at California State University, Northridge, Esha Momeni, has been arrested and jailed for a stated “traffic offense.” Momeni, a graduate student in the Department of Communication Studies, had been in Iran for several months conducting research via video interviews for her master’s thesis on women’s movements. According to reports, Momeni is a member of Campaign for Equality which seeks to campaign on behalf of Iranian women. She is not the only member that has been arrested in connection with the mission of the campaign. Esha Momeni, 28, a graduate student at the university’s Northridge campus, was taken into custody Oct. 15 in Tehran on “suspicion of committing a traffic offense” while driving on the Moddaress Highway, the human rights group said in a statement. Police then searched her family’s home in Tehran and confiscated her computer and footage of interviews she conducted, Amnesty said. She was taken to Evin Prison, and authorities told her relatives she would be released quickly if they didn’t publicize her arrest, according to Amnesty. When officials at a branch of the country’s Revolutionary Court told the family no information on her case would be released until an investigation is completed, relatives decided to make details of the arrest public, Amnesty said. Momeni has not been charged with any crimes and is at risk of being mistreated or tortured, the group said. “We’re tracking reports and official statements and will continue to monitor the situation,” Nicole Choueiry, a spokeswoman for London-based Amnesty International said today in a telephone interview. I am deeply concerned that one of our graduate students, Esha Momeni, has been arrested and detained by Iranian authorities while conducting research as part of her Master’s degree requirements in Mass Communications at California State University, Northridge. My understanding is that her thesis project focused on women’s issues in Iran. Ms. Momeni is a U.S. citizen. She is a student invested in learning and understanding current conditions in the country of her family’s origin. Anyone who values knowledge and the role of academic inquiry in shedding light on the human condition should be concerned. We are in support of the efforts of the U.S. government in their efforts to secure Ms. Momeni’s immediate release and are in the process of contacting the following individuals and organizations to obtain their assistance: Senator Diane Feinstein, Senator Barbara Boxer, Representative Brad Sherman, the Department of State, and Permanent Representative of the Islamic Republic of Iran to the United Nations Mohammad Khazaee. The university has taken action by contacting the Iranain ambassador to the UN, Congressman Sherman and Senators Boxer and Feinstein.